Aching legs are a pain - literally - and while most support socks are targeted firmly at particular conditions or functions, such as sport or travel, innovative Atom Milk Compression Open Toe Socks are for everyone, every day. The ‘secret weapon’ is Lanati milk fibre, made from the protein strands in actual everyday drinking milk! The amino acids in milk fibre bring many benefits, such as moisturising skin during use, naturally sanitising and anti-microbial, and the ability to wick sweat moisture away. 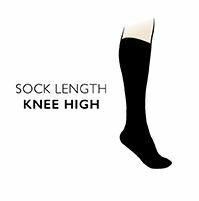 Of course, the main function is to improve blood flow, and Atom Compression Open Toe Socks offer graduated compression to 18-22mm Hg, British Standard Class II, but in a sock that is comfortable and silky - glossy even - soft and easy to wear with a ‘stay-put’ non-constricting cuff. These international (British conceived, USA designed and Italian made) socks have a cooling open toe detail (with soft comfort opening) allows the socks to be used with peep toe shoes or sandals, while a reinforced heel brings durability.